On April 21, 2009, the Argentine Republic submitted the outer limit of the continental shelf to the United Nations Commission on the Limits of the Continental Shelf (CLCS), a technical body created by the United Nations Convention on the Law of the Sea (UNCLOS), based in New York. In August 2012, during the 30th Period of Sessions of the CLCS, the Subcommission for the Argentine Republic was created, thus starting the process of consideration of the outer limit of the continental shelf, submitted in 2009. Argentina conducted in-depth and thorough scientific and technical tasks which allowed it to determine the outer limit of its continental shelf. 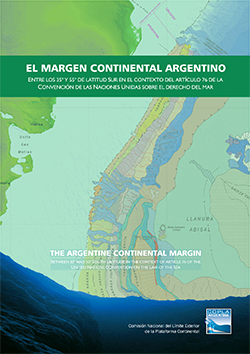 This work provides certainty about the geographical extent of our sovereign rights over the resources in the seabed and subsoil along more than 1,782,000 km2 of Argentine continental shelf beyond 200 nautical miles, which are added to the approximately 4,799,000 km2 located between the baselines and the 200 nautical miles, as can be seen on the map (Illustrative Diagrams). The outer limit of the continental shelf of the entire Argentine territory —continent, the South Atlantic islands and the Argentine Antarctic Sector— is made up of 6,336 points of WGS84 geographic coordinates. The limit submitted complies with the provisions of UNCLOS and the Scientific and Technical Guidelines of the Commission on the CLCS. When determining this limit, all available resources were used to identify the most beneficial limit for our country according to the applicable formulae and constraints. This is an example of a State policy that Argentina has implemented throughout almost 20 years with seriousness, professionalism and focus on the objective. This will strengthen its presence in the world, while reiterating the Argentine inalienable rights over a politically, economically and strategically important area such as the South Atlantic. The Subcommission that considered the outer limit of the Argentine continental shelf was created in August, 2012. During the period dedicated to the analysis of the Argentine submission, nine rounds of working sessions were held, namely in August 2012, February/March 2013, July/August 2013, October/November 2013, January/February 2014, August 2014, November 2014, February 2015, and August 2015. In the session that took place in August 2015, the Subcommission completed the analysis of the Argentine submission, starting the stage of consideration by the CLCS Plenary. On August 27, in keeping with the Rules of Procedure of the CLCS, Argentina made its oral presentation to the Plenary. Finally, on March 11, 2016, the Commission on the Limits of the Continental Shelf (CLCS) adopted by consensus (with no negative votes) the Recommendations on the Argentine submission of the outer limit of its continental shelf. The two northernmost points of the outer limit of the continental shelf ―referred to as RA-01 and RA-02― remained pending, as no agreement had been reached about the role played by the Salado Transfer in the distortion of the margin in that area. COPLA worked intensely between March and October 2016, obtaining new data and performing reprocessing tasks which made it possible, without compromising on the scientific grounds contained in the original submission, to use other foot of the slope points so as to determine the two pending outer limit points. With these new data, on October 30, 2016, Argentina made a Partial Revised Submission to the CLCS. On February 14, 2017 Argentina made the oral presentation of such submission to the CLCS Plenary in its 43rd Session. After this presentation, the CLCS decided to consider the Partial Revised Submission during this session, and on March 14, the final presentation was made to the CLCS plenary. In that same session, on March 17, 2017, the CLCS adopted the Recommendations with regard to those two points. Once again, Argentina obtained positive Recommendations from the Commission on the Limits of the Continental Shelf in connection with the two points that had remained pending in the northern part of the limit. Thus, the analysis of all the outer limit points of the Argentine continental shelf has finished, except for the areas subject to a sovereignty dispute with the United Kingdom, and the sector governed by the Antarctic Treaty. By not pronouncing itself on the area surrounding the Malvinas Islands, Georgias del Sur Islands and Sandwich del Sur Islands, the Commission acknowledged the existence of a sovereignty dispute between Argentina and the United Kingdom.